One problem that has long been a concern is how to turn managers into effective coaches when they have little or no practical experience with kaizen and have never personally engaged in basics such as set-up reduction, visual controls, creating a flowline or kanban system, etc.? This is in addition to the constraint we face where most managers (especially senior managers) have no interest or desire to engage in kaizen, or they see kaizen as something that only low-level employees do. Take a sports example: It is almost impossible to be a coach and coach effectively if one was never been a player. About the only way you can come close is if you spent a lot of time listening to people who played and who coached the game for many years. 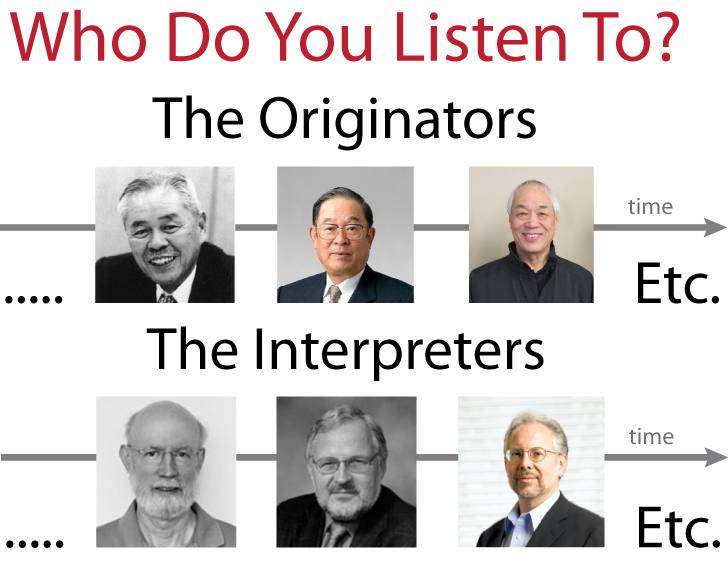 The question then arises: Who should managers (and others) listen to when it comes to TPS/Lean? A coach who played the game for many years, or an analyst (someone who interprets the work of the originators)? I have long felt that people have listened too intently to the analysts who have not actually “played the game” – the interpreters of Toyota’s management system, not the people who actually created it. I think that it is easy for all to agree that someone who actually created something is a much better guide than someone who studied it second-hand. That is not to say that interpretations are not helpful. Good interpretations can be extremely helpful and illuminate many fine points. But, more often than not, interpretations are lacking. Important features are misinterpreted, under- or over-emphasized, or left out, because, not having “played the game,” they are not aware of what is truly important. If you have never been personally responsible for manufacturing or service operations, then your interpretation is surely handicapped. The handicap may be large or small, but the interpretation is handicapped nonetheless. It is difficult work and easy to make mistakes, in part because there is a big difference between being there and one who interprets the results much later in time. I know this from first-hand experience in my interpretation of Frank George Woollard‘s work, despite my manufacturing experience. For example, U.K. English is not the same as U.S. English, and the thinking, resources, and circumstances in 1920s England were different than the thinking, resources, and circumstances in 1920s America or 1930s Japan. Remarkably, generations of American management scholars and Lean management experts have had great difficulty accurately interpreting Frederick Winslow Taylor’s work in Philadelphia (and it continues to this day). So, you can image that English-speaking people would have even greater difficulty accurately interpreting Taiichi Ohno’s unique and difficult-to-understand work. I have documented some of the interpretation problems in this blog (click here, here, and here) and elsewhere. For example, when Taiichi Ohno says “…kanban [was] the tool that that kept us from failure and misjudgment.” (p. 52), what does he mean? Do we understand the importance of this? No. So we need to think deeply about it because I have never heard an interpretation of this. You won’t hear it from any of the analysts. Nor will you hear it from me. But, you might hear it from Chihiro Nakao – if you ask the right way. I have never sought to interpret TPS because it is far too difficult (I’ll admit it; who else will? ), many analysts have tried to do it (all unsuccessfully), and it was never my strongest area of interest. Instead, I focused on Lean leadership and the “Respect for People” principle, as well as Lean transformation process failure analysis (both mindset and methods). I have had valuable industry experience with kaizen, having learned many of the fundamentals well from Shingijutsu, and practiced it continuously for over two decades. 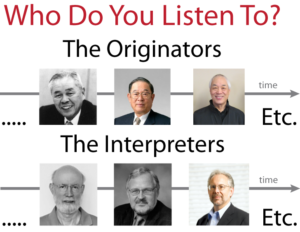 In addition to the practical kaizen experiences, part of my ability to be an effective coach is the result of having spent far more time listening to the originators than to the interpreters. I truly believe that the people striving to advance progressive management in their organizations should listen to the originators first, followed by the interpreters. This view is consistent with what I have always done in my own research and what have always told my students when they engage in research: “Find and study the original sources of information. That way you will know if the interpretations are accurate or not, what’s missing, etc.” (click here for example). I say this to you first and foremost as a professor who wants to help people learn, succeed, and prosper. Finally, it is not an either-or proposition. Original sources and interpretations can complement one another. And later re-interpretations can be better than first or second generation interpretations – or not. Original sources are the best sources to learn from and should form the fundamental basis of your understanding of TPS and Lean. This will help you better understand, learn from, and appreciate (or criticize) the interpretations. It is never too late to listen to the originators. Make them your focus for the next few years. Sir, I wonder you can use our time teach us. This post didn’t bring value. Please you can focus in improvements in our systems. Hello Rodrigo – Thank you for your comment. The purpose of my blog is to provide opinions, observations, and critiques about various aspects of leadership and management. The focus of the blog is to expand the understanding of leadership and practical problem-solving. It is not to improve the technical aspects of production systems, though the blog post does contain a link to great resources that will help you improve your system. Perhaps some of my other blog post will be to your liking – there are 267 more to choose from. If none satisfy you, then my blog is probably not for you. Other blogs, such as that by Michel Baudin, may be of greater interest to you. His blog is wonderful. I think the post did bring value, it depends on what you are looking for. A blogger can hardly be expected to improve your systems as he has no intimate knowledge of them. Take what you can from the text and apply your own intelligence to the practical problems confronting you. As far as sawing the branch, I believe I am simply being honest and making clear my areas of focus and limitations, which others who advocate Lean are not prone to do. They take credit for vastly more than they have actually done, and that includes some of the most recognized Lean practitioners. Credit for doing something is not always given in the way we want or expect. Sometimes proper credit is not given until a much later time but that is not to say that the ground work was not laid and done. I know that when I did my many years of Lean efforts it was a challenge and not much credit was given but was often stolen by others. Blame was the game but true believers will be able to rise above and pull through as most people do see the sincerity, honesty and respect of your efforts. True, honest and sincere Lean is very contagious as many will hop aboard as momentum builds. To me, Lean gives workers the respect and dignity they want for their work from the owners is what is important, not so much as who the originators were because every culture has its own lean thinkers and originators in some regard. Because being thrifty, fast ,cheaper, better and happier thinking goes back a long way in human history. I really think that many farmers did this just to survive many ago as newer and better ways of agriculture came about. As Robert Hall wrote in 1983: “The art of innovation in reaching for the ultimate production system must be practiced. It cannot be understood vicariously”. I really feel sorry about some of the comments you had to receive here. It appears to me, that many people (still) just want to hear about the “great” solutions to other people´problems in order to copy it and hope things will get better. As far as I am concerned, this is far away from real lean which is based on underlying principles, we may still have not understood to the full extent. Thanks a lot to bring into words what I sense as well. Lean (currently) is understood mainly to lower costs at all costs (also by headcount reductions) rather than extending value creation with the given resources. All too often youngsters from university get into the role of “lean experts” whereas the managers seldom take a role on their own to learn about the principles, the behavior and mental models at play in human interactions in organizations. I remember vividly a moment in time when the workforce was slowly introduced to lean principles, push & pull, and kaizen through practical workshops (building pens in a small production line). The senior executive strictly refused to get involved in actual participating, rather he only would count the time and do what he did so on a daily basis in the office: controlling people, and giving orders. Lean, especially in Germany, is still in its infant stage, as the rigid hierarchical structures and behaviors are seldom challenged, nor perceived in a mindful way. How can a manager become a successful, respected coach for the other members of the total workforce if not willing to experience first hand? PS. : We as we truly are passionate about lean are the ones who shall be the coaches (even when not been given this formal role) to help others to increase the learning about complex systems within organizations and ways to transform the current state of operation towards a more elegant and resourceful way.